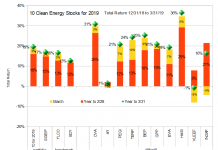 After a strong performance all year, the stock market stumbled in August, along with clean energy stocks in general, although the sector continues to outperform the broad market. 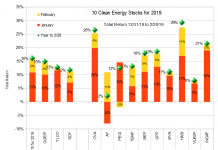 My Ten Clean Energy Stocks model portfolio again came out on top, buoyed by two winners (Seaspan Preferred (SSW-PRG) and MiX Telematics (MIXT). Both were catalyzed by strong earnings reports at the start of August, which I summarized last month. 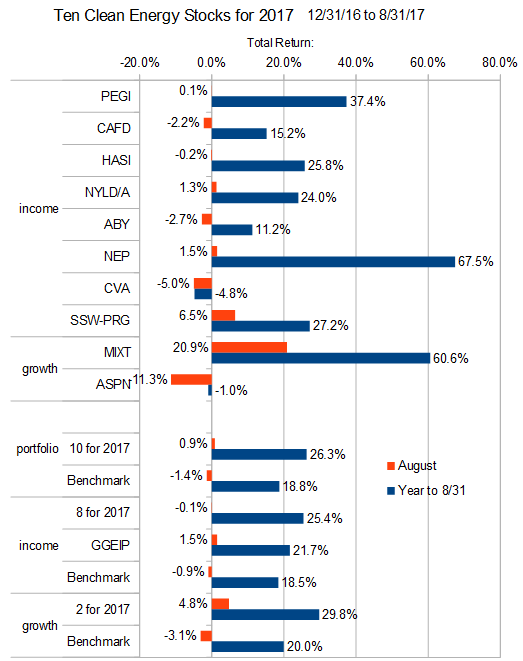 For the month of August, the model portfolio was up 0.9%, for a 26.3% total gain for the year to the end of August. 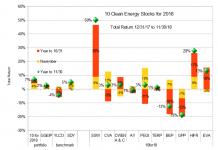 It’s clean energy benchmark (see here) fell 0.1% for a total return of 18.8% year to date. The eight income stocks declined 0.1%, compared to a 0.9% decline for their benchmark, the Yieldco ETF (YLCO). The Green Global Equity Income Portfolio (GGEIP), a private clean energy income strategy which I manage, gained 1.5%. For the year to date, the income stocks are up 25.4%, GGEIP is up 21.7%, and their income benchmark is up 18.5%. The two growth stocks gained 4.8% for the month, while their benchmark, the Powershares Wilderhill Clean energy ETF (PBW), lost 3.1%. For the year to date, the growth stocks are up 29.8%, compared to PBW which has gained only 20.0%. See the chart below for individual stock performance. Wind-focused Yieldco Pattern Energy Group did not report any significant news in August. Yieldco 8point3 Energy Partners’ sponsors First Solar (FSLR) and Sunpower (SPWR) continue to look for a buyer for their stakes. Given the consistent nature of its cash flows, but there is a fair amount of disagreement as to what buyers might be willing to pay. Based on my analysis of the company’s sustainable cash flow is $0.68 to $0.76 per share. Other Yieldcos have recently been buying projects in the 9% to 11% cash flow yield range, which would put the value of 8point3 at at best $8.45 a share. This is why I have sold short calls on the stock. At the other end of the range is Travis Hoium at Motley Fool. He thinks “a reasonable range for a sale would be a 7% rate of return on project level CAFD of $140 million for the year or more. After you pull out the $717 million in debt, an equity value of $1.28 billion, or $16.22 per share is around what the yieldco would sell for on the low end.” I don’t know where he got the $140 million number, since 8point3’s CAFD guidance is $91.5 million to $101.0 million. If you add back in holding company costs of $27.9 million, you get $119.4 to $128.9 million. Removing unsustainable cash flows from this number would lower it still further. Sustainable infrastructure and clean energy financier Hannon Armstrong did not release any significant news. The stock held steady for the month. Yieldco NRG Yield’s (NYLD and NYLD/A) parent, NRG Energy (NRG), like 8point3’s parents, continues looking for a buyer. Since the stock is trading in the middle of my $15 to $21 valuation range, I’m holding my shares but selling covered calls on the position. With Both NRG Yield and 8point3 for sale, the better valued of the two should be expected to sell first. I put NYLD’s sustainable CAFD at approximately $1.20 to $1.30 per share, meaning that it is currently trading at a 6.6% to 7.1% cash flow yield. The comparable numbers for 8point3 are 4.8% to 5.2% (see the 8point3 section above). If either Yieldco finds a buyer willing to pay over the current market price, it seems much more likely to be NRG Yield. Atlantica Yield did not release any significant news in August. NextEra Energy Partners advanced slightly in August. At current levels, I no longer consider NEP to be attractively valued, had have sold all my positions except some short puts with a $30 strike price which I expect to expire unexercised. The market initially liked waste-to-energy developer and operator Covanta Holding’s earnings report at the end of July, but has since fallen back. I think Covanta remains an excellent buying opportunity. Trading at a very attractive 7% yield, the company is enjoying a robust market for waste disposal, and is poised to see revenue growth as its new Dublin facility enters full commercial operation. That alone should be enough to send the stock price up, but if the either of markets for the power or recycled metals it sells recover, we should see an additional earnings boost, which could lead the stock to take off. Until it does, we’re getting paid a 7% dividend yield to wait for that to happen. As I reported in the last update, leading independent charter owner of container ships Seaspan sees an improved the market for container ships coming over the horizon. The company’s common and preferred shares were buoyed up, with the series G preferred gaining 6.5% in August, adding to an 8.4% gain in July. These single-digit monthly moves wouldn’t be at all remarkable for common stocks, but preferred securities, with their fixed dividends, tend to be much more bond-like and to make much smaller moves. With a recovering containership market, the risk that Seaspan might not be able to maintain its preferred (let alone common) dividends are fading astern. I would not be at all surprised if the preferred shares recover to par ($25) by the end of the year. 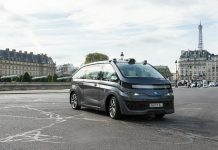 Vehicle and fleet management software as a service provider MiX Telematics advanced 21% after a strong earnings report on August 3rd, which I discussed in last month’s update. The 25% dividend increase also likely helped the stock along. Aerogel insulation manufacturer Aspen also reported strong results at the start of August, and the stock initially took off in response. After a weak fourth quarter report and outlook in February, I expected the stock to stay in the doldrums, and so sold my shares. After an initial positive reaction to second quarter earnings, Aspen is back where it started. I’m not quite ready to get back in yet, but if it falls further in the next couple months, I may decide that the time is right, but I expect it will be a very small position given the general market uncertainty. I had maxed out my positions in Seaspan Preferred and Covanta at the start of August, and I had previously maxed out my position in Atlantica. Besides Atlantica and Covanta, I don’t see any stocks I would rush to buy right now. Seaspan Preferred shares still look like good values, but not the screaming deal they were. If I were to take a new position now, I’d be more likely to buy the common. I will start taking some of my gains in Seaspan Preferred as the shares approach $25. 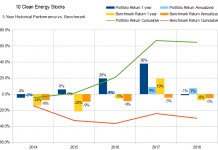 Although the economics of clean energy are strong, recent stock market highs, the likely slow increase in interest rates, and political uncertainty continue to make the stock market a risky place to be right now. Readers who do not have a healthy allocation to cash might consider taking some gains from their winners. I’m considering selling more short calls on CAFD as a hedge on my other Yieldco positions. Previous articleTesla’s Buffalo Solar Tiles: As Hot As They Seem? Any thoughts on the drop in GLBL today? It seems extreme given that things seem on track and the only news being that they are scheduling a shareholder vote on the merger? The only thing that would warrant the drop is a push out of the closing date? One weird thing is that there is no explicit date in disclosure for the meeting (typo?). Could it just be algos going crazy? I think it was just crazy. The lack of a specific date in the filing is because the date it not set yet… this is a preliminary filing, they still need to set the date. I thought the reaction was so weird that I bought a lot of GLBL on Tuesday (at $3.80-85 and Weds $3.85). I’m massively overweight here, but the opportunity seemed too good to pass up. What is your opinion on ABY? It dropped 2,5% yesterday, down 10% from early august. I think about buying some more, but wonder if there is something going on – but no news released by the company. You have any information or an update? Thanks! Unchanged since the last update. http://www.altenergystocks.com/archives/2017/08/ten-clean-energy-stocks-2017-summer-harvest/ I could not figure out yesterday’s drop. I’d be buying except that I’m already pushing up against my position size limit. I joined you Tom, on GLBL. To tempting to pass up here. Short of a fallout of the merger, it seems it’s just a waiting game for things to settle/rationalize. *acquisition, not sure why I keep calling it a merger…. J- I believe I figured out why the pullback: it’s because there is a class action suit, and the settlement forms went out right when the stock started to fall. If the settlement does not get approved, the merger can’t happen. I don’t see why it would not get approved (I certainly tendered my shares, and everyone who has bough GLBL for merger arbitrage (probably most of us now) would do the same) but I think it’s the uncertainty that caused the late sell-off. Merger arbitrage is certainly one place where you have to have nerves of steel. Thank you for of all your efforts. I think the recent weakness is due to the secondary offering. No plans for an article right now… have not had as much time as I’d like to write.